In gaelic times, it is thought Thaon was a defensive position and a cross roads. Then in Roman times, it was on the way from Bâle (Basel) to Scarponne (todays' Toul) and this road was improved or built up (Todays' Forest of Thaon). The main defense position was probably held at todays' cross roads between Rue Kléber and Voie d'Illet. It is believed it was an hostel ("gîte d'étape") for traders and soldiers. 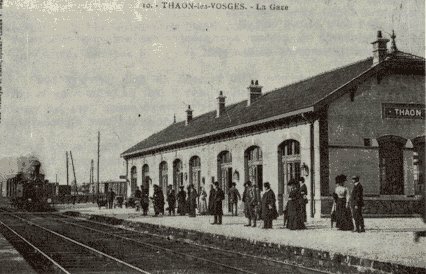 According to Abbé Olivier, History of Thaon-lès-Vosges, (1904), Thaon was first mentioned in a book in 1003, as "Ad Tadone" which means "Valley Post". Until 1509 Thaon was under Epinal's rule and the Lords of Beauffrémont was administering the activities in the village. In 1539, they sold their rights to the Dukes of Lorraine. From 1766 onwards, Lorraine was conquered by the French and it took two generations for the people of Lorraine to be completely integrated into France. 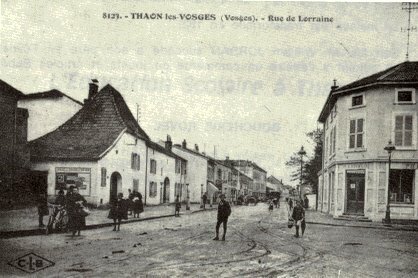 The village comprised about one hundred inhabitants at the beginning of the 18th Century, 300 people were reported to live in Thaon in 1789 and finally 431 in 1860. 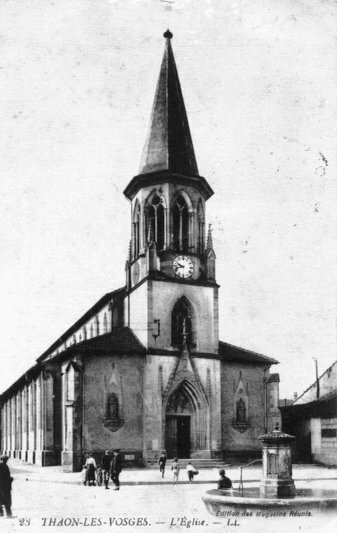 From 1872 the industrial era began when Alsatian people escaped the war and crossed the Vosges mountains to settle down in the Lorraine valley. Within a few years' time the village was changed into a town. One of the Alsatians most involved was Armand Lederlain, his statue is on Market Place and was erected by the citizens of the town in memory of his work. In 1909, Mr Brandenberger and Mr Lager, both of them engineers, discovered CELLOPHANE at the local factory. They discovered it by studying the works on Cellulose of the British Scientists Cross and Bevan. A first bench test produced a 95 cm long roll of cellophane, it was first used to manufacture hats and then to prepack food. In 1912, Cellophane was registered at the local court in Epinal and during the second world war, B.T.T. produced Cellophane to protect soldiers' life from gas attacks.